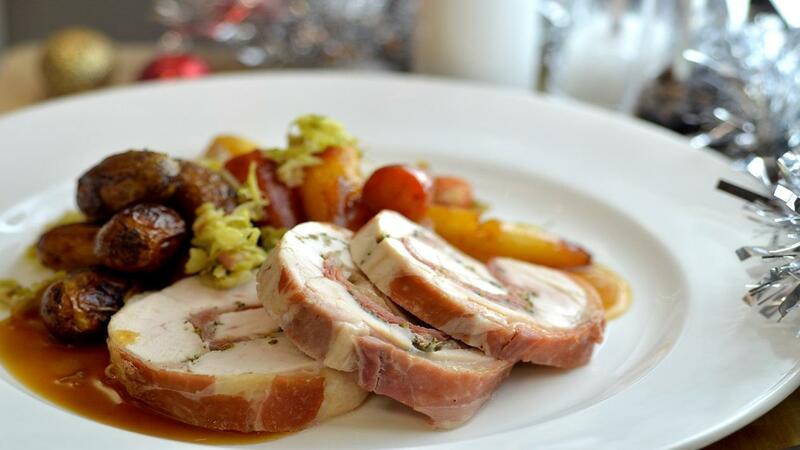 Get some festive flavour on your menu with this aromatic turkey recipe. See how you can bring in some special taste with dried cranberries or onion powder to enhance the festive flavour. Chop the fennel and sage together then mix with the sea salt. Lay the parma ham on to the work top. Place the boned out turkey on top and place the breast filets into the gap where the legs meet. Spread with the KNORR Garlic Puree then sprinkle over the herbs. Starting from the bottom, roll turkey tightly with prosciutto, keeping prosciutto in place. Tie together withbutchers stringat 3-inch intervals. Heat the oil then seal the turkey on all sides. Place into a roasting tray and cook for 50-55 min. or until the temperature reaches 72°C. Remove from the oven then loosely cover and allow to rest for 30 min. Slice the turkey into thick slices and serve two per portion.